Lili has loved art since she was very little. I would put her in her high chair with a crayon and she not only had perfect pencil grip, but at a young age she began creating some wonderful art. She loves just about any type of art, although painting is probably her favorite. Since I can’t keep everything, I really need to take some pictures as a reminder of the various art projects she has completed. Posts about her art projects should become a regular visitor here at the World of Weeks. For the last few months, she has been taking art classes at the McLean County Arts Center. 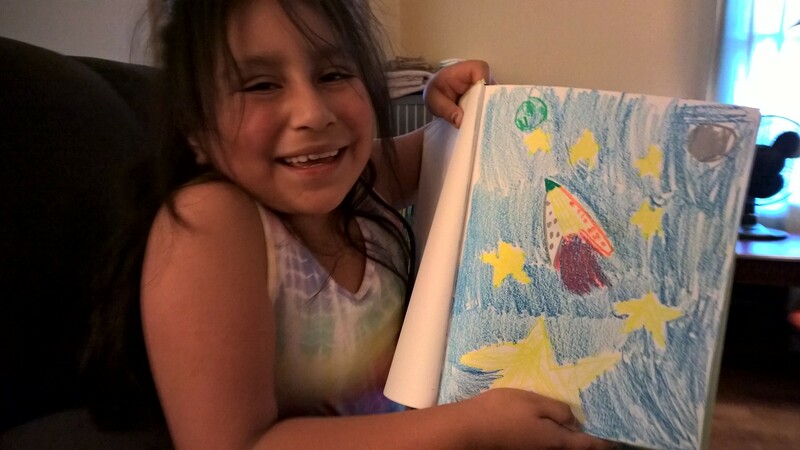 At the end of her art class this week, her teacher gave her a sketch book. She has been creating pictures and shared her first completed picture with me yesterday. I’m thrilled that she has found something she enjoys so much and I think there will be a lot of art classes and sketch books in her future.